The Peg Perego John Deere Ground Loader will allow your little one to drive, scoop and dump! Take their outdoor playtime to the next level. They don't have to go all the way to a farm to operate a tractor. Now they have a battery powered tractor of their own to make the most of their imagination with. This John Deere tractor features a 12 volt rechargeable battery and charger to keep the ride going all day long! Watch as they kick it into the gear with the 2-speed shift option. They can go at a safe and kid fun speed of 2.25 or 4.5 mph. Parents, you can relax with the 2nd gear lockout feature that doesn't allow them to go past the tractor speed limit. Switch into the reverse safe and easy peezy like a real car. Automatic breaks and high traction wheels make the drive extra safe, comfortable and easy. These durable wheels can ride over grass, dirt, pavement and gravel, so they can take this tractor almost anywhere. 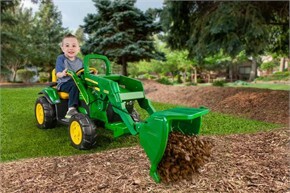 The kids tractor includes a functioning front loader scoops, lifts, and dumps from the driver's seat. With the adjustable seat armrests made for growing kids, your little beginner driver can use this kids tractor year after year! Designed for children ages 3 to 7. Weight capacity 85 lbs. Availability:The Battery Operated Tractor Ride On takes approximately 2 business days to leave the warehouse plus transit time. Please Note: This Item ships ground ONLY and does not ship express or to Alaska, Hawaii, PO Boxes or APO addresses.